Saffron Fields Vineyard producers of elegant Pinot Noir and Chardonnay wines. Winemaker Tony Rynders uses fruit from multiple vineyards to produce this wine, producing a Chardonnay that is represents the vintage beautifully. A classic cool climate Chardonnay with Green Apple, Pear and Lemon Lime Flavors with beautiful minerality undertones. Another beautiful Chardonnay from our Estate Block. This year features tropical fruit, meyer lemon and beautiful minerality. A blend of two old world clones, Pommard and Wadenswil which do very well at our vineyard and are the oldest plantings on our site. This wine provides everything that you would see in a great Pinot coupled with the great characteristics specific to Saffron Fields. lavender, violet and rose petals on the nose followed with intense black fruit and pepper on the palate followed with citrus notes on a long finish. Moderately dark reddish purple color in the glass. Leading off are aromas of blackberry jam, earthy flora and a hint of vanilla. A glorious mid weight plus core of dark fruits arrive on the attack with luscious richness and follow through with a well-sustained mid palate, finishing long and generous. Despite the generous sap, the wine is light on its feet with submerged tannins and exquisite balance. Still highly pleasurable the following day from a previously opened and re-corked bottle. Score: 93. Prince of Pinot. A regional view of the vintage. This wine contains approximately 40% of estate fruit – the remainder is from some very nice vineyards spread out over the various AVAs in the valley (Eola-Amity, Ribbon Ridge, Chehalem, etc.). This is our everyday wine. Very food friendly with a meal or perfect to drink by itself if you just feel like a glass of wine. This is the most complex of our Pinot Noirs, a perfect blend of the four clones grown on our site. It showcases the personality of the vineyard with dark fruit, lavender and citrus notes and a long spicy finish. If you taste a vertical of this wine you will be able to taste common flavor elements in every year, regardless of the vintage, that are very characteristic of our vineyard. This wine while great drinking very nicely right now will continue improve with age for another 10-15 years. A great regional view of the vintage with fruit from five of the six sub-AVAs of the Willamette Valley AVA. Tasting Notes: Complex aromas of dried cherry and tobacco, evolving into slight smoke and umami. The palate shows flavors of tart cherry, cranberry, toast, roasted coffee, and cocoa powder supported by bright acidity. The long finish displays flavors of sassafrass and cherry. Elegant aromas of fresh basil, and strawberry lead into flavors of rosemary, sun dried tomato, and plum with elegant tannins. The finish is long with flavors of spicy black pepper. Primarily sourced from the oldest vines on our property; this is a wine that will evolve gracefully over time. Aromas of violets and rose, leading to a palate of cranberry, cocoa powder, and freshly baked bread. With time, the palate develops with flavors of roasted plums, cherry jam and toasted baking spices. The mouthfeel is soft with supple tannins and acidity. This is one of our most popular wines! Our flagship wine made with four clones of Pinot Noir. Drinking beautifully now but will continue to improve for ten more years with proper cellaring.Heavy aromas of black cherry, dark plum, raspberry, violet, mineral, caramelized sugar, and black tea. The palate is rich and round, expressing lots of black raspberry, blueberry compote, sassafras, sweet cherry, and oak spice with supple tannins and a long, velvety finish. Elegant aromas of fresh basil, and strawberry lead into flavors of rosemary, sun dried tomato, and plum with elegant tannins. The finish is long with flavors of spicy black pepper. Primarily sourced from the oldest vines on our property; this is a wine that will evolve gracefully over time. A perfect size to open or gift for the special occassion. This wine is bottled in a limited edition beautiful hand painted bottle, this wine will last for over 2 decades under proper storage. Elegant aromas of fresh basil, and strawberry lead into flavors of rosemary, sun dried tomato, and plum with elegant tannins. The finish is long with flavors of spicy black pepper. Primarily sourced from the oldest vines on our property; this is a wine that will evolve gracefully over time. Bottled in a limited edition hand painted bottle. This is the perfect gift for the special occassion or for your personal wine library. Heritage Clones is always our most popular pinot noir. A blend of Pommard and Wadenswil clones from the oldest plantings on our property, this has classic black fruit flavors with savory notes of leather, cedar and black pepper. Drinking well righ now but will continue to improve for another 5-7 years. $95 per person Club Members $75 per person. 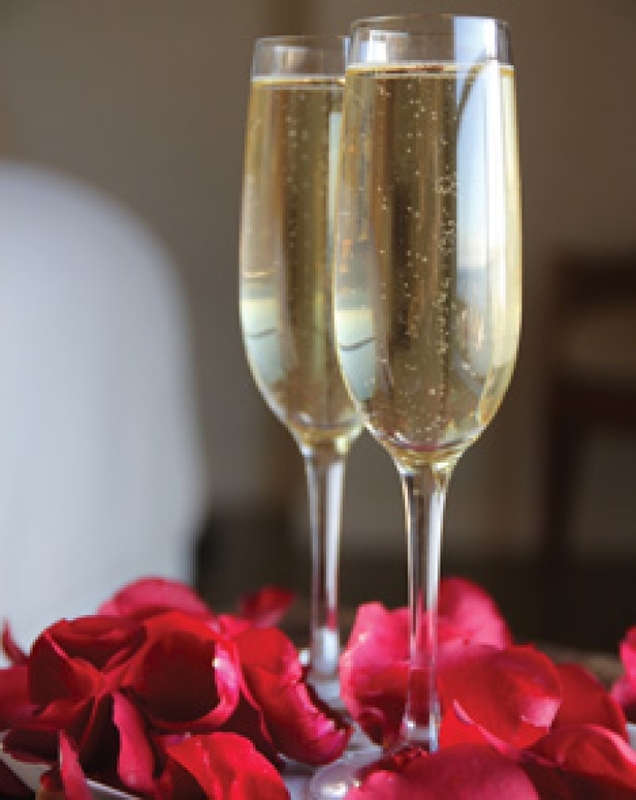 Thursday, February 14th, come celebrate Valentine’s Day with Dinner at Saffron Fields Vineyard! Enjoy a locally sourced, four course dinner menu paired with our Pinot Noir and our not yet released 2015 Rosé. Enjoy our beautiful space, while our art collection comes alive as the sun sets over the coastal range. It will be a very memorable evening! Please note: your card on file will hold the reservation. You will not be charged until Feb 8th. Cancellations made after 2/9/2019 will be charged 50% of the service price. No-shows and cancellations made with less than 48 hours notice will be charged 100%. We look forward to having you as a guest! Register and save time on your next purchase!